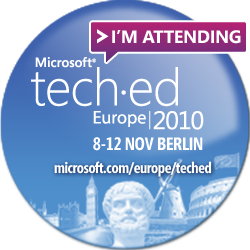 TechED Europe 2010 talks accepted! I will post an update as soon as I have further information about when and where these talks will take place. So stay tuned! 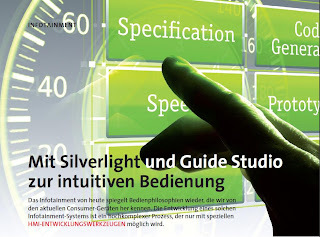 In der aktuellen Ausgabe der Automobil Elektronik ist ein von meinem Kollegen Jan Babst und mir geschriebener Artikel über Silverlight for Windows Embedded unter EB GUIDE Studio: "Mit Silverlight und Guide Studio zur intuitiven Bedienung" erschienen. Ich habe zwei Webcast aufgenommen, schauen Sie doch einfach mal rein! MARK YOUR CALENDARS: Windows Embedded Compact (Windows CE) Live Chat! Do you ever setup a BSP with PCI support? It should be easy enough because all you need is there, however it is spread across your entire C:\WinCE600 folder. But what are the parts you may use without changes, what libraries must be included and what is hardware-specific and must be adapted? You may start with the PciBus.dll. But there is nothing hardware-specific, that’s the wrong end of the thread. No, it’s no KITL we want to setup. But anywhere between PciBus.dll and PQOAL must be a hardware-specific part, which must be ported to our PCI host controller. The PCI bus provides three address spaces: Config-Space, Memory-Space and IO-Space. Each PCI device “shows” its internal registers or memory in up to six so-called BARs. These BARs are in Memory or IO Space. It is common usage to iterate all buses and devices to find a specific controller on the PCI bus. Under Windows CE it’s better to implement a bus-agnostic driver calling DDKReg_GetWindowInfo(), but that’s another story. Memory-Space and IO-Space are ordinary address spaces you may access with e.g. VirtualCopy(). The access to the Config-Space could be different: memory mapped or via special registers. As a result we need some special routines to read or write the Config-Space. The key feature to access the PCI bus in your BSP is a good implementation of OALPCICfgRead() and OALPCICfgWrite(). And what about the KITL and PCI? Well, KITL is an extra DLL and has no direct access to the OAL. That’s why KITL implements it’s own versions of OALPCICfgRead() and OALPCICfgWrite(). These implementations call the KernelIOCtl(IOCTL_HAL_DDK_CALL). That’s a lot of grepping work to find out how PCI works. I hope to be your Ariadne's thread if you ever have to fix a PCI problem below PciBus.dll. I stated in my previous post, that the download link for the Windows Embedded Compact 7 (WEC7) PCTP on Connect was incorrect. Well the WEC7 download link is fixed now! Oh, and if you have connections issues when using the WEC7 Virtual PC BSP, check out Olivier’s post! MakeImg creates a copy of our DLL named K.MyDll.dll. Each version of the DLL will relocated to the corresponding XIP section in User-Space and in Kernel-Space. Up to this point the facts are easy and every BSP developer should know about it. What about LoadLibrary()? What happens if I try to call LoadLibrary(L”MyDll.dll”); from a driver in the Kernel context? The answer is: LoadLibrary() loads K.MyDll.dll, you don’t have to add a “K.”! But what if the DLL needs another DLL, e.g. My2ndDll.dll? It is obvious that My2ndDll.dll must be also a Kernel-Mode DLL, but the name mustn’t be K.My2ndDll.dll. 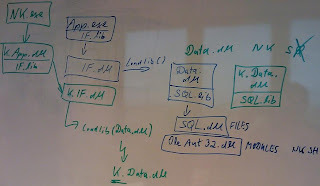 Alternatively you may move My2ndDll.dll from the MODULES section to the FILES section. Remember to remove any K or Q! But if My2ndDll.dll is on your target, K.MyDll.dll will be loaded successfully. 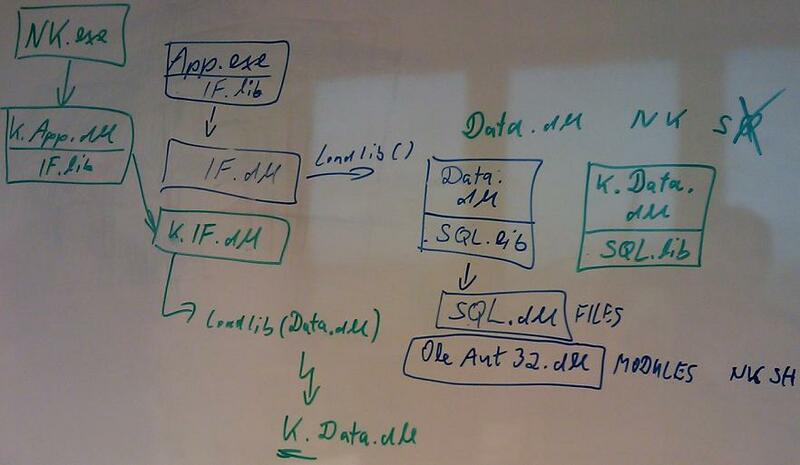 It’s a good idea to review all DLL dependencies and think about the special functionalities of your DLLs. Some DLLs do kernel-specific things and cannot run in User-Mode, e.g. read from KSeg1 addresses. Some DLLs use application interfaces you won’t move to the Kernel, e.g. MFC or OleAut32. Windows Embedded CE QFEs for July 2010 have arrived! new updates for Windows Embedded CE are available for download. Some issues (especially the scheduler fix for Windows CE 6.0) have been resolved, no time to loose and get them now! More information for each update is provided in the Readme document available after the individual update(s) has been installed. 100728_KB2290232 - This update addresses some Internet Explorer issues. 100709_KB2259301 - TCP optimization code may cause an access violation. 100716_KB2284242 - DNS leaks may occur after VPN connection is established. 100726_KB2288940 - The radio buttons may not get selected properly. 100727_KB2290128 - This update addresses security issue with Internet Explorer. 100727_KB2252004 - This update addresses a few thread leaks in udevice.exe system process. 100722_KB2263918 - The block may get marked as bad block during CompactDataBlock process. 100731_KB2289488 - During stress tests the device could get into a state where the critical compaction loop runs during boot initialization of the Flash MDD. This may prevent the device from booting. RPM may show exception message "Error displaying GC heap view: The given key was not present in the dictionary"
100723_KB2267739 - Co-processor registers may get restored in the wrong thread. 100729_KB2158497 - This release updates a number of time zones. 100722_KB2193954 - This update adds missing curly brackets in CIsochronousPipe::AddTransfer. The final version of this ebook will be available in october and will be free! I'm sure most of us hit the problem of that annoying linker error "unresolved external symbol "aoein0hepqo2washpeofh a@foo" (ok, I just hammered the keyboard - it's no real live symbol name!). After triple-checking the library link list it turns out that (again) the mixing of C and C++ modules and libraries is the root of the problem. But what to do if you have a C++ module that references an API function declared in a header file that is not prepared to be included by C++ code? METTLER TOLEDO is a global manufacturer and marketer of precision instruments for laboratory, industrial and food retailing applications and launched a new generation of density meters and refractometers. MT hired EB as a software partner to strengthen its own software team thereby utilizing EB architecture, design and software project management expertise. MT and EB jointly created a complex software solution that integrated 250 screens in 40 different device combinations on a Windows Embedded CE platform. The solution reused parts, such as the user interface concept and basic software design of a previous project for titration devices and used EB GUIDE Studio as HMI tool.